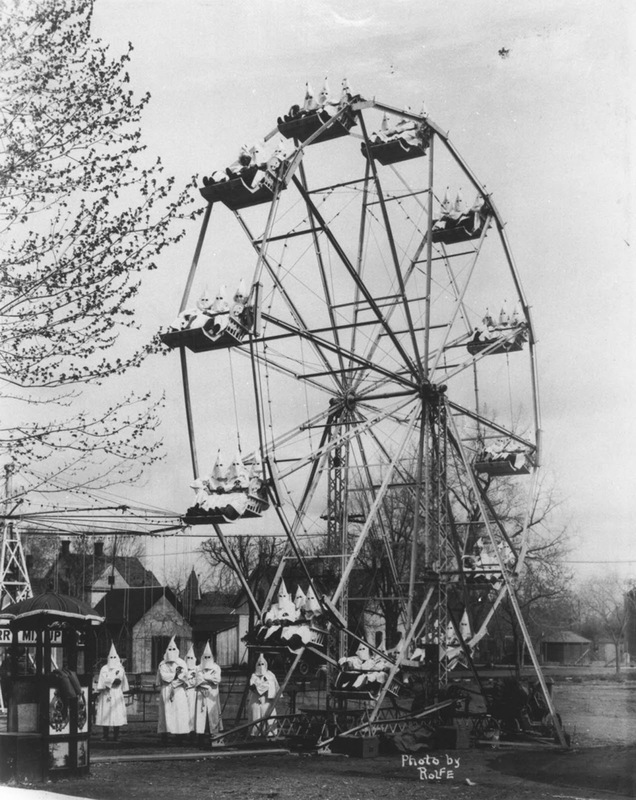 Ku Klux Klan on a ferris wheel, 1926. On April 27, 1926, the Cañon City Daily Record ran a surprising bulletin on its front page. Right under a notice that the local junior high school was putting together a variety show, the local newspaper of the small central Colorado town printed the headline “Klansmen pose for picture on merry-go-round”, along with a brief, staid description of a parade of hooded locals that went from the Klan headquarters on Main Street to the travelling amusement park that had been set up a couple blocks away. However, that photo wasn’t actually printed along with the headline (the photographer didn’t share it). But when the photo came to light more than 65 years later, it served as a reminder of the history of Ku Klux Klan. To understand how a picture of 41 Klansmen on a Ferris wheel came to be, you first have to understand the background of the KKK in Colorado. Cañon City was the Klan capital of the State from 1924 to 1928: Colorado Governor Clarence Morley was a Klansman, Colorado Senator Rice Means was endorsed by the KKK, Denver Mayor Benjamin Stapleton was connected with the Klan, and the Grand Dragon of the Colorado Klan, Reverend Fred Arnold, was the minister of Cañon City’s First Baptist Church. By the time this photo was taken in 1926, the Klan’s power was at its zenith. According to the Daily Record, the Klansmen were invited to pose for the portrait by the site’s proprietor, William Forsythe, a Klansman himself, who brought his mini-carnival down south from Fort Collins. In 1915, the second Ku Klux Klan was founded in Atlanta, Georgia. Starting in 1921, it adopted a modern business system of using full-time paid recruiters and appealed to new members as a fraternal organization, of which many examples were flourishing at the time. It opposed Catholics and Jews, especially newer immigrants, and stressed opposition to the Catholic Church. This second organization adopted a standard white costume and used similar code words as the first Klan, while adding cross burnings and mass parades. At its peak in the mid-1920s, the organization claimed to include about 15% of the nation’s eligible population, approximately 4–5 million men. Internal divisions, criminal behavior by leaders, and external opposition brought about a collapse in membership, which had dropped to about 30,000 by 1930. It finally faded away in the 1940s. They are talking about the second KKK, opposing Jews & Catholics. The KKK you're thinking of is the one opposing blacks. Organized movement, defending tradition and family values, the only aspects that really matters in a functional society. But then, nowadays what's supposed to be progressive and morally accepted is to be a dysfunctional family, parents delegating all the education of their children to the government, creating true functional analphabetics, while they indulge themselves in the ephemeral pleasures of the moment.